Unique antique western. very nice condition. The shiny places in the pictures are glare from the lights. In antique used condition with wear & age spots, one spur has two rowels (looks like it made that way). Solid/sturdy in good shape. The previous owner said they were from circa 1880's to 1890's & were by August Buermann. This beautiful large Buckle is made by Crossroads Buckles Floresville Texas. Rodeo Champion Heeler 2009 Crossfire Productions Trophy Belt Buckle Team Roper Roping Size 34 Belt . Condition is preowned and has signs of wear. Shipped with USPS Priority Mail. The shiny places in the pictures are glare from the lights. In used condition, solid & sturdy in good shape. Its been cut off a belt. Nicely detailed with gold colored trim. The Buckle is approx 1 1/2" long x 1 1/2" wide at the widest part. Lot Of 4 Montana Silversmiths Cowboy Belt Buckles. Condition is Used. Shipped with USPS Priority Mail. STERLING SILVER BELT BUCKLE - QUIET BIRDMEN - QB - RENO,NV. Here are the details: 1. Western Trophy Cowboy Belt Buckle. Fits a 1.5" Belt. It is used with wear/marks/scratches/rust/torn leather strap. New Trophy Rodeo Champion Belt Buckle Champion Team Roper Roping Broken!! 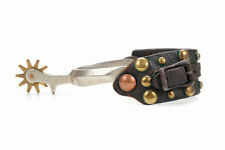 Western Trophy Cowboy Belt Buckle. BROKEN. JUST FOR DECORATION. Type: Horse Stirrup. Material: Wrought Iron. Subject Matter: Heart Shape. For sale is new Hermès 32mm Belt buckle. The buckle is Gold Brushed model. 100% genuine buy. This horse bridle is as found and it's in excellent condition for its age, it does show signs of wear from years of use but, that's all part of its charm. These gorgeous "Texas" uniform buttons are in mint condition, never used and still on their original card and paper wrappings from the factory. The card contains 24 buttons. No markings on the back. Inventory Number 8963. Up for your consideration is a ornate cast iron stirrup with a very beautiful heart design. 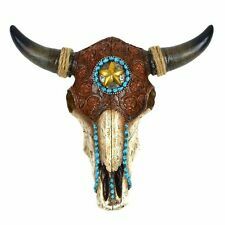 This would make a great addition to your western decor. Good condition for its age. Inventory Number 8568. This would make a great addition to your western decor. Good condition for its age. It has moderate to severe surface rust and pitting. We have for your consideration a set of vintage 1917 US leather saddle bags. The bags are leather with brass reinforcements, snaps and rivets. Please examine photos carefully for condition. Very primitive. Approximate Measurements It measures 42" x 13" wide. 5.# Markings US Long 1917, W.J.D. Condition Good condition for its age. It has minor to moderate wear on bags and moderate to severe wear on the straps, a couple have been repaired. Please examine the photos carefully for condition. Also they have canvas inner liners. These liners are usually missing. See description above for further info on the condition. Inventory Number 9903 202545. Stout, Creatively Placed, Bailing Wire Kept this Collar Useful. Authenticity and Charm. Or Add Your Own Creative Touch. , signs of wear, dusty, could use a cleaning. More than likely from the 1950-1960's. It has the George W Shiebler mark and the Tiffany & Co. mark. This is a really nice old sterling silver belt buckle we bought from an estate. This is sterling silver and we didn't polish it at all because we didn't want to disturb. Pure. 999 SILVER Art round (HOPI- KACHINA) FROM THE FRANKLIN MINT OFFICIAL COINS INDIAN TRIBAL NATIONS This is JUST LIKE the coin you will receive and is in new condition. It is really beautiful in its detail. 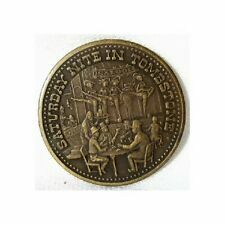 They are used with wear/marks/scratches/tarnish. Antique Collection Two Percussion Gun Holster. Condition is Pre-owned. Shipped with USPS First Class Package. Embroadery lined and fancy design. Three belt loops on back. Well used but good condition for its age. Seems quite rare compared to nornal holsters. No breaks, cracks or tears. Connectors and buckles in place. Vintage Montana Silversmiths RES Champion 2011 Horse Barrel Racing Belt Buckle. Condition is Used. The all leather belt measures 42/44. USPS First Class Package. 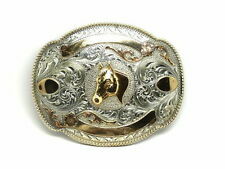 Buckle is stamped on back Nickel silver, western design etched on front. Belt length is 36 1/2" and approx. 40" total buckle is 4" x 2 3/4". Inventory Number 8176. Good condition. Especially when viewed from the back side, the portrait appears to be that of Bill Cody! Very rare and original, ca1890’s Small Size, Woven Tapestry featuring a portrait of William F. “Buffalo Bill” Cody. Antique Harness Old 8668. Inventory Number 8668. The yoke is made of a hardwood and has leather covering horse hair padding. It has an very ornate design carved into the wood. There is a rope attached at both ends. Inventory Number 6491. Good condition for its age. Inventory Number 6932. I believe it is brass. 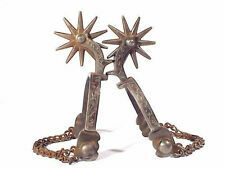 This stirrup has an unusual ornate design on each side. This would make a great addition to your western decor. Good condition for its age with no cracks, breaks or repairs. Hello, you are viewing my sale for an Antique Tractor Seat. This tractor seat would make a Wonderful Country Western Barn Decor. This is tractor seat #1. There are no breaks or repairs. Local pickup is accepted. Just a few minor abrasions and scuffs to the painted cast iron surface. [Stamped 1930 on the back right wheel].